I find myself going back and forth when it comes to zombies. On the one hand, I can't deny the over-saturation of the sub genre in the last decade or so, and I'm always looking for the next big thing to revitalize it with an original or unique take. On the other hand, I wouldn't be looking for that in the first place if there wasn't still some part of me that just loved the crap out of a good zombie movie, and I've found on many occasions recently that I've been able to enjoy some contemporary efforts even without any innovative element (see HERE, HERE and HERE for examples). This ambivalence carried me into the zombie romantic comedy Warm Bodies, the latest attempt at a new twist on the walking dead, and while I'd say it was better than I expected, I still can't get over some of the unavoidable structural flaws that keep it from reaching the level of say, a Shaun of the Dead or a 28 Days Later. 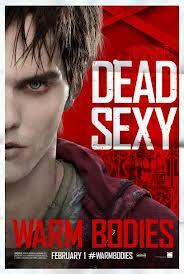 Warm Bodies is the story of a zombie named R (or Arrr) in a post-apocalyptic wasteland who spends his time aimlessly shambling about an airport until he happens upon a still living girl and falls in love with her, just after eating her boyfriend's brains. Most of what we learn about him we get through his internal monologue, suggesting a much deeper inner life for a zombie than we ordinarily assume, and the consequence of this fact upon the film's larger mythology presents my first and biggest problem with the movie. 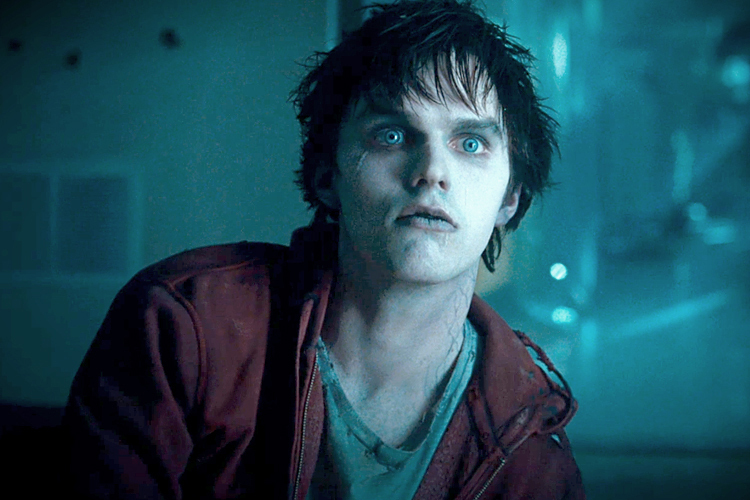 The zombies in Warm Bodies come in two types, those who retain some degree of humanity, fleeting glimpses of memories and routines, and those who have completely lost their humanity, shedding their skin to become "The Bonies." This alone is a somewhat interesting twist, but unfortunately, instead of stopping there, the film uses this distinction to make the traditional zombie into something far different than what we're used to, and as far as I'm concerned, something that betrays the spirit of the genre. Zombies don't retain their humanity, and they certainly don't regain it. That's the whole point of being a zombie. That's why zombies are scary. They look human; they reflect the visage of the living, thinking people they used to be, but they are not human anymore, compelled only to destroy humanity wherever they find it. They are at best a sad parody of human existence, the parasitic nature of our species upon the planet turned against itself. Now, some would argue that to question this at all is a bit absurd, as the whole notion of a zombie apocalypse is the product of fiction. Much like when Superman fans complain about Donner's film having him fly backwards around the Earth to turn back time, the common retort to any nerd rage is that Superman can't fly, or shoot eye beams, or do anything, because he doesn't exist, so why quibble over details. This argument belies a lack of understanding and respect for fiction, especially in a fantasy context. When rules are established, even if they don't make sense in the real world, you need to stick to them, or whatever fictional universe you're working in becomes something else entirely. Vampires that shimmer in sunlight aren't real vampires, and zombies that talk and fall in love aren't real zombies. Now, obviously there should always be room to make changes where warranted. I can't exactly wish for innovation and be so strict as to make that innovation impossible. Not only that, but the standards are legitimately different from fan to fan. For instance, in my introduction I cited 28 Days Later, which I found to be for its time a wonderful twist on the zombie movie, but many purists would say it doesn't qualify because they aren't technically undead, or in some cases simply because they happen to run fast. At the end of the day, when it comes to what violates the spirit of the genre, its an ineffable quality, an "I'll know it when I see it" kind of thing. This is all to say that I'm not accusing any zombie fan who likes this movie of some sort of nerd apostasy, but rather, I simply think that Warm Bodies goes too far, to the point where I would argue that what makes zombies fun is sacrificed for the sake of a story that probably shouldn't be told. Before, I obliquely referenced Twilight, and I don't want to suggest that this film is as bad as that series, as I think if nothing else it is well constructed and entertaining in its own right, but I just can't get past the fact that in order to tell this kind of story at all, they essentially do to zombies what Twilight did to vampires. 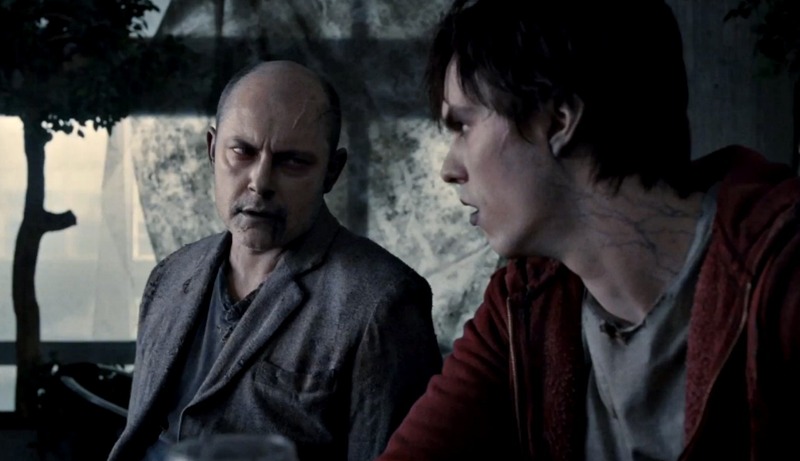 If you can get past all of that, I can say that Warm Bodies does tell a decent story that comes together well enough, even if its monsters are something other than what the movie calls them (and ultimately not even monsters at all). Before we learn that the cure for zombie-ism is The Power of Love, the first twenty or thirty minutes is a solid horror comedy piece examining the life of an undead drone from an interesting perspective, and then it turns into a strange combination of Romeo and Juliet and Beauty and the Beast that in the context of the film works better than you might think considering the implied necrophilia. There's a lot of heart and a sweetness to the whole thing that keeps you rooting for the characters as their two worlds conspire to keep them apart, and the romance is about as believable as possible under the circumstances. At worst I would say that it is the best possible way of telling a story that shouldn't have been told in the first place. Everyone tries really hard to fit the square peg into the circle hole and make it all work, but there's only so much they can do, and for me at least, its never enough to overcome the inherent deficiencies of the concept. I do want to make special mention of Rob Cordary, who once again surprised me by turning in a particularly sympathetic and heartwarming performance. While I've never outright disliked him either on The Daily Show or in other media, I have to admit that I was on the verge of getting sick of the same smarmy character he's so well known for. The first time I ever saw him play anything else was in last year's Butter, where his unflappably caring father figure proved to be one of the very few things I liked about that film. Then in Seeking A Friend For The End Of The World, he practically deconstructed that self-centered jerk character, placing him in a world where everyone was as apathetic as he was, once again becoming one of the few highlights to another otherwise lackluster movie. 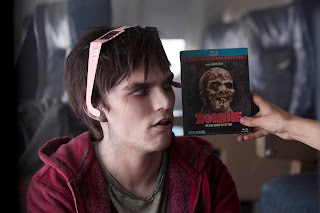 While there was certainly more to like about Warm Bodies, Cordary's zombie best friend is perhaps a more interesting story even than the main one, and easily the most emotionally resonant element overall. Granted, his character arc is the most reliant on the idea of zombies becoming more human, but since we're already there, even my general complaints can't diminish the fact that after a certain point, pretty much every time he comes on screen is a moment worthy of fist pumping. I would have much preferred that this story be told from his point of view to be honest. That is to say, that would be my second preferable option after not doing it at all. 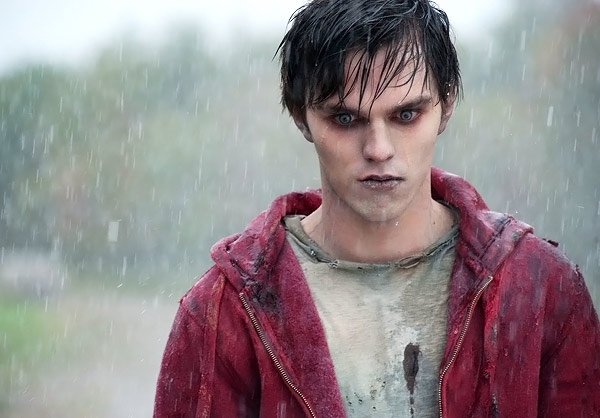 I hate to harp on this, but I've sat through too many zombie movies good and bad to give up now and just call a movie like Warm Bodies good enough. If you have to change the idea of what a zombie is this much to make it work, then maybe the genre truly is dead. I personally haven't lost faith in it, and I'm still waiting for that great re-interpretation, or even just a stylistic or contextual improvement that retains the basic zombie concept, but in a fresh and exciting way. Beyond my nerdy gripes, this latest effort has enough going for it that I think a lot of people will no doubt find much to enjoy, and especially if you're not a fan of zombie movies precisely because they are so dour, this film's optimistic tone just might be the one to get you back into them. But then, that's the rub isn't it. You make a zombie movie that people who hate zombie movies can love, where does that leave someone like me? Bitching incessantly about it, apparently.